You know what a nice surprise is for a February Gallery Stroll? No snow and 50 degree temperatures almost everywhere you go. --- It honestly felt like a fall showing as you could walk anywhere you pleased without the ice rink walkways, puddles at every gallery doorway, and groups of people huddled around the one heater in the room before they looked around and briskly made their way down the street. I'd like to keep this weather for a while, occasional rain in the valley and snow in the hills. This month I made my way over to the showing happening at Art Access where two different exhibitions were happening. 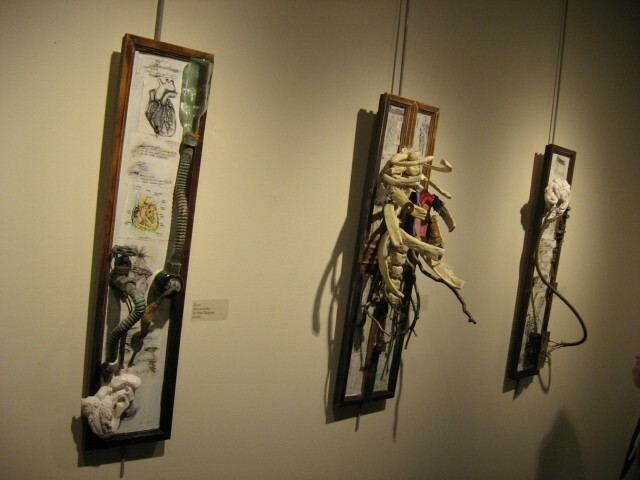 The first featured Strong Women, which was a mixed media show featuring several women from the art community as a group showing featuring Terrece Beesley, Carol Berrey, Jennifer Broschinsky, Sasha Gorham and Izrael Szuchay. 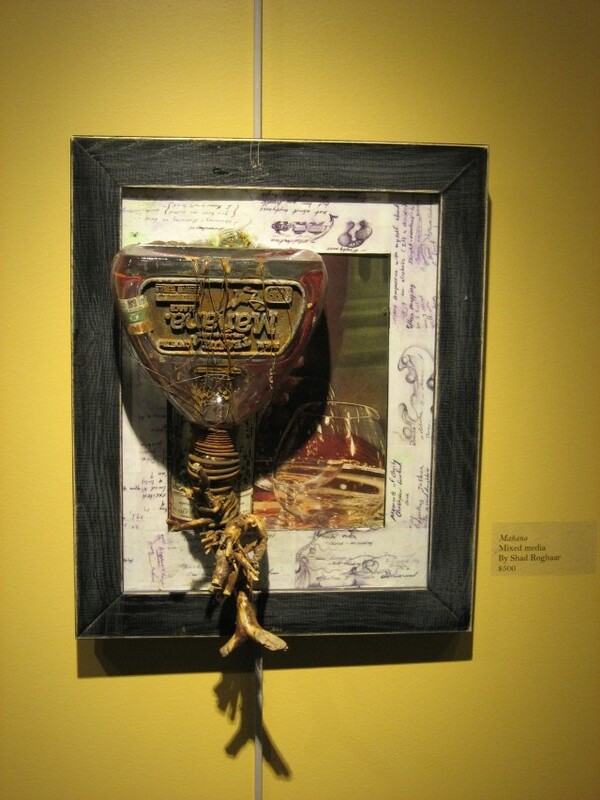 The second called SOBER delved into mixed media as well, focused more on the painful recovery from addiction by artist Shad Rogharr. Today we chat with Rogharr about his career and works for the show, along with pictures from the entire gallery which you can check out here. Gavin: Hey Shad! First off, tell us a little bit about yourself. Shad: Hello Gavin. I was born in Logan, Utah in 1975. I have always been interested in art. I did art for the fourth and had an amazing art teacher named Zan Burningham. I continue this “art in all aspects of my life” approach with my career as an art teacher. Shad: I have always liked to draw, it was a meditation for me, an escape, and something that focused my sometimes-scattered mind. I was influenced by any amazing image I saw, I love abstract art even though it was not necessarily appreciated in my household. My grandfather was a very talented artist, and I loved to look through his art books, and witness his sculptural skills, (he carved life-sized carousel horses). Later, artists like Robert Rauschenberg, Francis Bacon, have influenced me and abstract artists like Pollock, Frankenthaler, Gerhard Richter, and Rothko. Lately I have been inspired by urban and conceptual artists like David Choe, and Ai Wei Wei. Gavin: What drew you toward drawing and painting as your main mediums? Shad: I drew and painted because they were the most accessible mediums. I showed an aptitude at drawing very young, and started painting, mainly with watercolors in high school. I loved clay, play dough, and silly putty, but never took anything sculptural seriously until college. Gavin: You received a BFA from Utah State in 2004, what made you choose USU and what was your time like in their program? Shad: I went to USU because it was home, and I loved their art program. 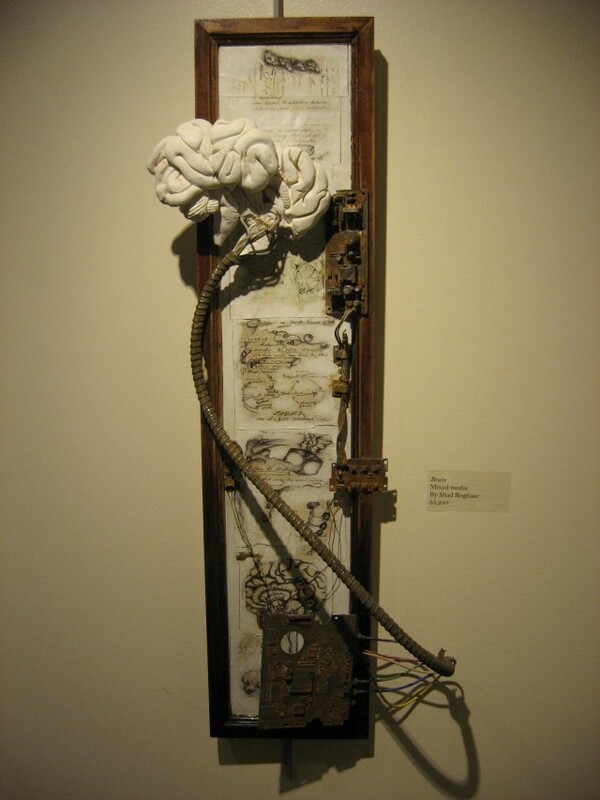 I learned from some great art professors there, Chris Terry, Greg Schulte, and Marion Hyde were a profound influence on my painting and drawing, and I got an introduction to sculpture from Eileen Doktorski. I was raising a child on my own during college and had a lot of personal struggle. This influenced my art and my art gave me an outlet for anxiety and frustration, a trend that has continued. Gavin: How was it for you breaking into the local art scene during that time and taking part in exhibitions and group shows? Shad: I had some success with the local art scene right out of college, but could not land an art job, so I went back to school at UNLV to get my teaching license. 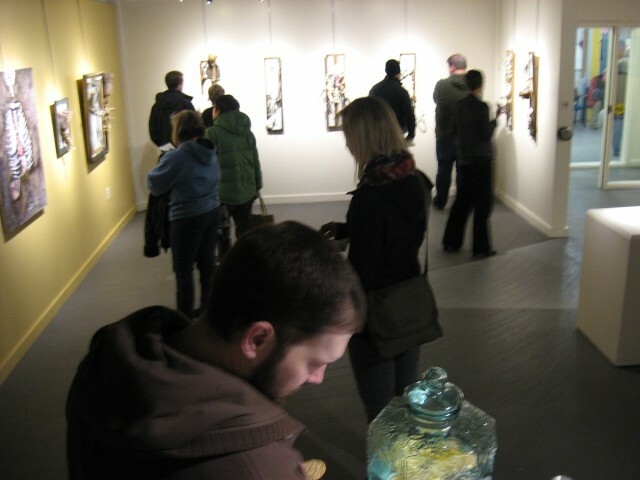 I exhibited in the gallery stroll at Nobrow Coffee in a combined show with Jamaica Trinnaman and later in a solo show. I have exhibited at Tin Angel, and Citris Grill. I also have had shows at Salt Lake Recording Services, and have some work permanently up there. The local scene is hard for non-traditional artists. If you don’t do landscapes or typical figurative work, it is kind of difficult to break in to most of the galleries. The Urban Art Show, and places like the Tin Angel are great for artists who don’t do the traditional “Western Art” thing. Gavin: What was it that got you interest in mixed media works and expanding your pieces beyond the conventional framework? 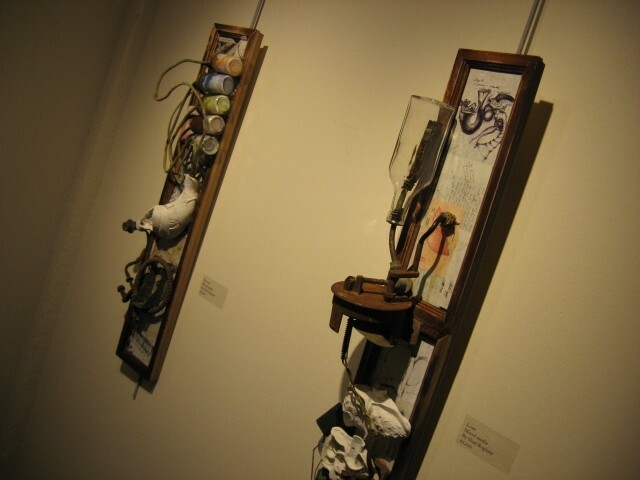 Shad: I have been working with found objects, combined ceramics, drawn, and painted works for a little while now. This is a more expressive way for me to work than just painting. It allows for more narrative and a more intimate connection to the art materials. I like that mixed media gives you the freedom to express and create in a way that is more than just represented observation, it illustrates the thought process of the artist, and allows for more of a tactile experience. Mixed media is the culmination of this for me. This does not detract from painting and drawing as pure art forms on their own, I am just following the urges of my current creative process. grade talent fair. I went to high school at Sky View in Smithfield. Gavin: Did you branch into ceramics and sculptures from there or was there a different catalyst behind taking on those mediums? Shad: Creating ceramics and sculpture comes from both my college experience and my everyday job. I became interested in sculpture in college, and have learned ceramics by teaching it and experimentation. I combined these two mediums with painting and drawing to form complete works. I like to work with lots of different media, and to experiment with them all. I focus on one at a time usually, however for this project I combined them all. Gavin: What's the process like for you in creating a new piece, from first concept to final product? Shad: Typically I have an idea for an artwork, or a series of works in my mind for a while. Some have a theme, but usually they are about a process or a specific medium that I want to work with. Some times I work out the series or a few examples of them in sketchbooks, then create an initial piece or prototype. If it works out, or I like the result then I expand upon the initial idea and set a goal for how many I would like to create, this is usually dependent on what I want to “learn, or master” from the experience. Some ideas or processes never end, maybe because I haven’t learned enough or mastered enough. Gavin: Do you change things as you're creating them or do you try to keep the original idea in tact to the end? Shad: These projects can and do usually change or evolve from the idea to the finished product. Some get better, or more complex, some become more simplified. The idea can require further narration, or the medium can react in way to my manipulations that inspires a new piece or series. Gavin: Where do you draw inspiration for your works from and how much of a challenge is it for you to apply that vision to your creations? Shad: I am inspired by artists that I have seen, from personal experiences, and some times just from the joy of creation itself. The works that have a personal narrative are always the hardest to create, because you have an idea in your head, then the limitations of media, materials or time can hinder you from bringing it to light. The works that I have done for pure joy, or from researching other artists are easier for me to create in a pure way. I always tell my students that art is about solving problems, some problems require more flexibility to solve. Gavin: What made you want to teach art yourself and how was it getting into the profession? 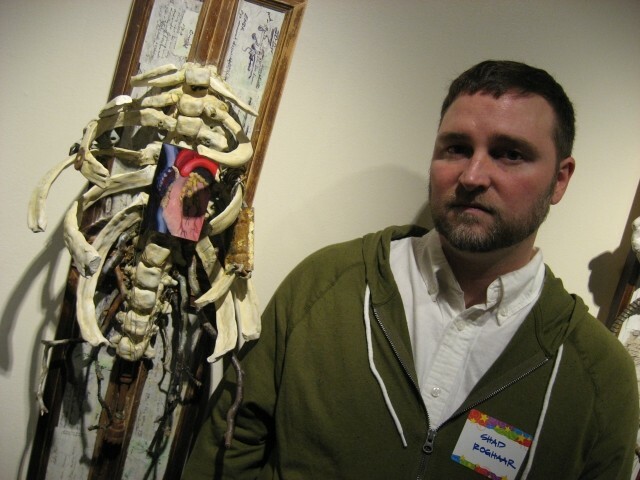 Shad: I wanted to teach art after my high school experience with Zan Burningham. She was a profound influence on me both in my work and on me personally. 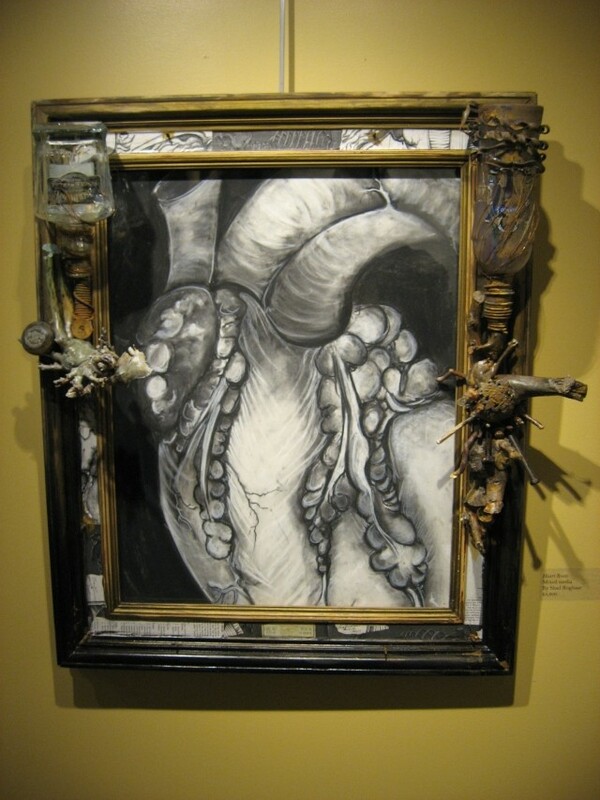 I began my college program in art education, but became disheartened by the classes. They did not offer me a lot of stimulation intellectually or artistically, after studying philosophy for a while I went into a fine art painting program instead. I began my teaching with ancient world history, then when I moved back to Utah I began teaching art. I love it, it has been a wonderful experience. I get to do what I love everyday, and inspire kids to do it also. Shad: The SOBER project came about from personal experiences with addiction, and from stories of other peoples’ addictions. I recently lost a cousin to a drug related suicide, and have been thinking about vice, addiction, and the stagnation that these things can cause. I thought about how it causes people to become stuck in a revolving loop, to neglect their real lives, for a type of false joy. 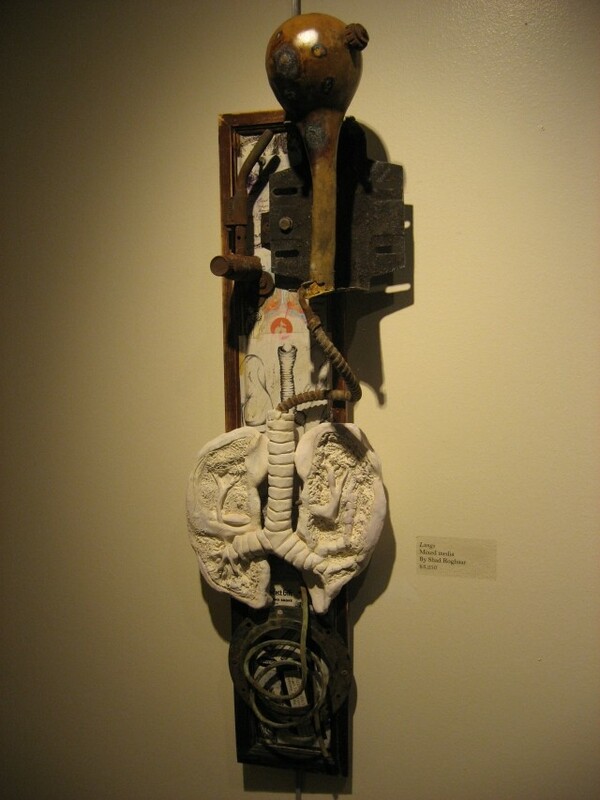 This neglect is where the rust comes in, the patched together organs and bones represent both the physical problems that are caused by addiction and the various ways that people go about trying to repair them, some methods are effective, some not so much. I am not making a moral judgment about any chemical or way people choose to live their lives, just communicating about the experience, and reacting to the various stories of addicts’ health and psychological problems. 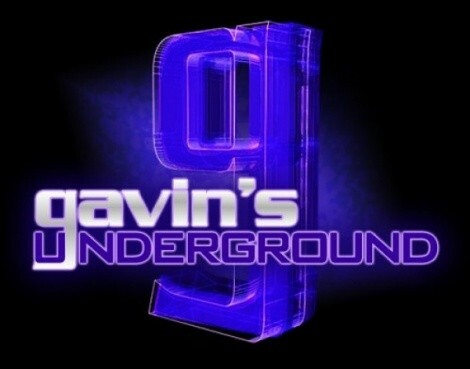 Gavin: How has it been working with Art Access and being a part of this unique showcase? Shad: Art Access has been great to work with. I have had a lot support from the staff and they are very accommodating and encouraging of the artists that they support. I have seen several shows at Art Access and have always been impressed by the quality of work there and the way that is shown. Shad: I think that the SLC art scene is good and getting better. There is of course Park City, which has a lot of galleries and is very supportive of the arts, and the downtown galleries that I love to peruse. There are still a lot of things that I would like to see in the arts in Utah in general. I would like to see more large-scale public works, with some sophisticated character. The urban arts scene is growing but not yet large enough to get a lot of attention, and galleries still have a pretty exclusive group of artists, the “Western Art thing” again, not that there is anything wrong with landscapes and cowboys. Shad: I have seen a lot of local artists that I like, I like the colors and themes of Ruby Chacon, I am impressed by the abstracts of Andrew Rice, and I am inspired by Nathan Florence’s Figures. 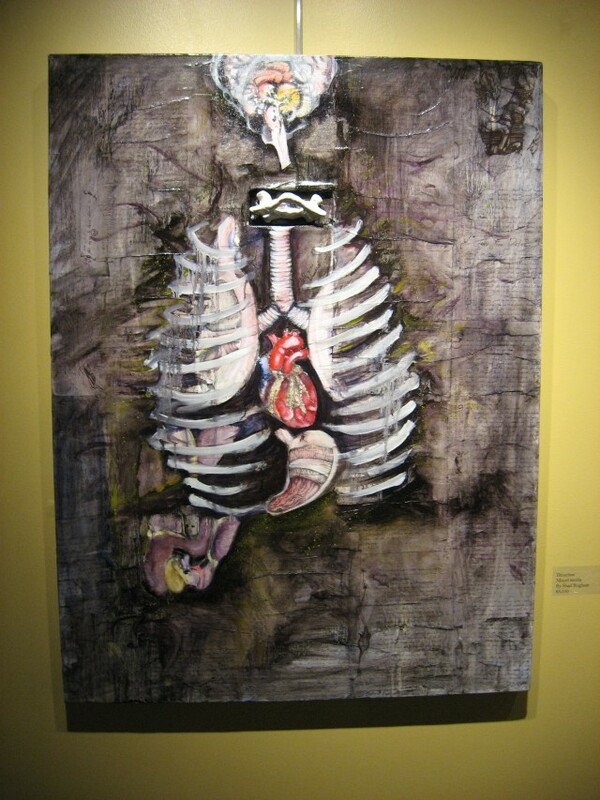 Jimmi Toro has also struck me as an extremely interesting artist with a great way of manipulating paint. 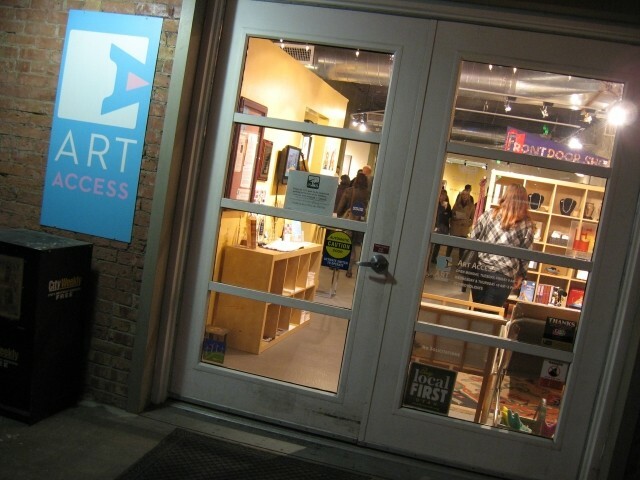 Shad: I like the gallery stroll and hope that it continues to grow and flourish. I have spoken to a lot of artists that have work on the stroll and I have yet to hear about a lot of work selling, or any artist making a living at only art. I would like to see more people buying art, not just for my sake, but for art’s sake. Shad: Now that SOBER is done and in the gallery I haven’t really taken a break yet. I have all of my art students and work to deal with everyday. I am starting a new series of paintings that are lyrical abstraction and I am thinking about adding cubism. I did a lot of these both in college, but have veered away from this, but I have been reading about late '50s lyrical abstraction and Picasso and Braque, so I am thinking about working in both styles at once and seeing what evolves. This is just one of a dozen or so ideas that I have tooling around in my head and in my sketchbooks. I of course would like to present any works or series at Art Access. Shad: I have been very encouraged by friends and family and I would like to thank them for all their love and support. I would also like to acknowledge the people I work with, David Wilde and Anne Cox, who are both extremely talented artists and teachers. Their critiques and insights have been invaluable.